ISIL and other primitivist, fatalist groups are easily herded and manipulated by anyone with money. How can a group apparently so formidable as ISIL be used so easily by its own enemies? Can they not see that they are pawns? Or, do these gullible followers willfully submit themselves as pawns to whatever forces they don't understand? If their sole objective is to prepare themselves as puppets for a god, doesn't this actually prepare them as puppets of men? The reason for ISIL's proneness to be manipulated and utilized by its own enemies is a fatal flaw in the group's theology. They promote superstition in the extreme. By believing everything is an act of its god, and everyone is a puppet of its god, ISIL does not believe in conspiracies or power politics. It cannot see them, even when confronted directly with them. Even if it knows its forces, like other militants in Syria, are led by Israeli commanders or treated in Israeli hospitals (as some reports have tentatively stated) ISIL will not believe it is a puppet of anyone but its god. If Netanyahu appears to be supporting ISIL indirectly, ISIL will only believe Netanyahu is a divine instrument helping ISIL. 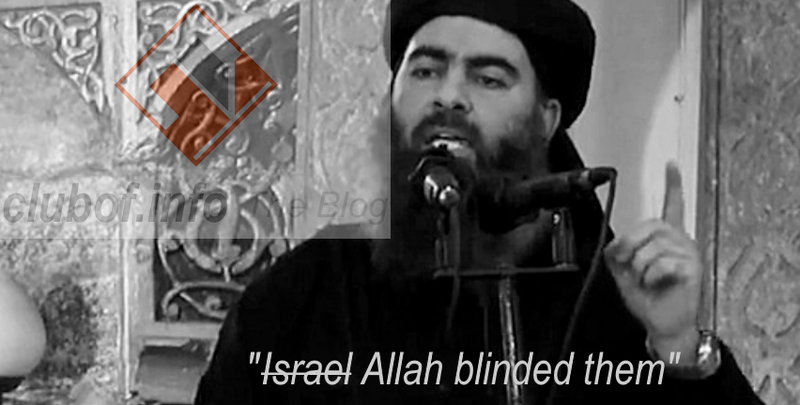 ISIL might even believe Netanyahu is some god or angel sent to protect them. No god would be acting via Netanyahu or John Kerry to support ISIL's goal to overthrow the Syrian government, as ISIL would believe. Rather, these men are using ISIL. Their goal of overthrowing the Syrian government pre-dates the existence of ISIL, making it clear that ISIL could only be their puppet. ISIL is a puppet of no god, but human military planners. There is such a thing as having too much faith. There is such a thing as making up too many excuses for one's beliefs. At some point it all degenerates into the extremes of primitivism, superstition, and gullibility. If you keep saying 'they were blinded by the god' to explain all your fortunes in the face of an enemy, it is clear that you have no strategy and that your very leadership has succumbed to gullibility. Imagine how superstition will wreak havoc in the mind of a military commander. If the other side opens up a corridor for your units to flee on the battlefield, you will believe it is a miracle of your god. If the other side stops their artillery bombardment, you will believe that is a miracle of your god and emerge from the trenches. If your 'far enemy' sends planes to attack your 'near enemy', as the US nearly did in 2013 when it threatened missile strikes on Syrian government forces, this too is a miracle of your god. At some level, one wonders whether they are worshiping any god, or worshiping their own enemies. Certainly, the real agents behind ISIL's miracles are human, many of them sitting in Washington DC. And what happens when their fortune runs out, when their many enemies really all decide it is time to eradicate them? Will ISIL believe its own destruction is the will of its god? Will all these gullible followers commit suicide, believing it to be their god's plan, when they run out of support from US regional allies like Turkey and Saudi Arabia? ISIL is so convinced of supernatural intervention on the battlefields that it would accept almost anything as a miracle. This was apparent in some remarks made by ISIL about the Paris attacks. Rather than finding it suspicious that Europe left itself wide open to terrorist attacks by failing to adequately screen out the people the US had been unable to select as "moderate" militants even while they were still in Syria, the ISIL refrain was to say "they were blinded by Allah". If this is how they explain world events, then this is a group that has no grasp of reality, and absolutely no awareness of power politics or the cynicism behind it all. All of ISIL's successes are man-made. They have been driven not by any god, but by visible trails of money and special interests leading back to the Western regimes and their allies in the Gulf monarchies. ISIL today is nothing but a plaything of Western foreign policy. However, a group that purports to be the plaything of unseen gods and devils is likely to find no shame even in that fact. It will find a supernatural explanation for everything. It will never see shame in being a hollow puppet of foreign powers, because its theology preaches that everyone should strive to be a hollow puppet of any master they can find. Without realizing it, the gods worshiped by ISIL are foreign schemers manipulating the group and using it to topple the Syrian government in the civil war. The ones who have been blinded, and even led around on strings as puppets, are the gullible and empty-headed followers of ISIL. Their own blind deference to fate is a confession of this. To date, ISIL has been praising what it calls a god. What it is really praising is the golden calf of Saudi money, which means ISIL is giving thanks to rich men and hidden cowards when it claims to worship a god. In its gullibility, it sees its gains on the battlefield not as the result of a strategy of omission and willful failure by the US-led coalition, but as evidence that the US-led coalition is confounded and also a puppet of the same god. Since ISIL is absolutely fatalist and incapable of recognizing human agency in any event in the world, its followers are the perfect puppets. They are enamored by anything they don't understand or cannot see, which means they will revere any congress anywhere scheming to use ISIL to topple the Syrian government. It is also superstitious to always promote conspiratorial explanations of events, but the likelihood of conspiracy is far greater than the likelihood that ISIL territorial gains were the result of gods and devils intervening in the battlefield as they believe. The gullibility of ISIL and other extremist groups makes them easily herded, easily victims to conspiracies of man. They are incapable of seeing who may be using them, because behind everyone they only see their god. To ISIL, merchants of death and destruction are messianic figures, doling out enough weapons and gold to buy them.